Last week, the Dow Jones Industrial Average closed above the milestone level of 19,000 for the first time in history. This event brought with it a good deal of media attention and questions about what could happen next. • The Dow first closed above 100 in January 1906, but traded consistently beneath this level until 1924 and the 1920’s bull market. After the stock market crash of the Great Depression, the Dow last traded beneath 100 on May 26, 1942—some 36 years from the first time it closed above this level. • The Dow first hit the 1,000 level on an intraday basis on January 18, 1966. It didn’t officially close above this level until November 14, 1972—nearly seven years later. It didn’t break out above 1,000 for another 10 years in late 1982. • The Dow first closed above 10,000 in early 1999. After two massive bear markets, the last time it closed beneath the 10,000 level was another 11 years later in the summer of 2010. • All three milestones took place with extended valuations and after strong bull markets, which could help explain why longer-term underperformance occurred. How quickly has the Dow gone from one 1,000 milestone level to the next? The fastest 1,000 point move ever was only 24 days, when it moved from 10,000 to 11,000 in 1999. That move came out to an annualized return of 172%. 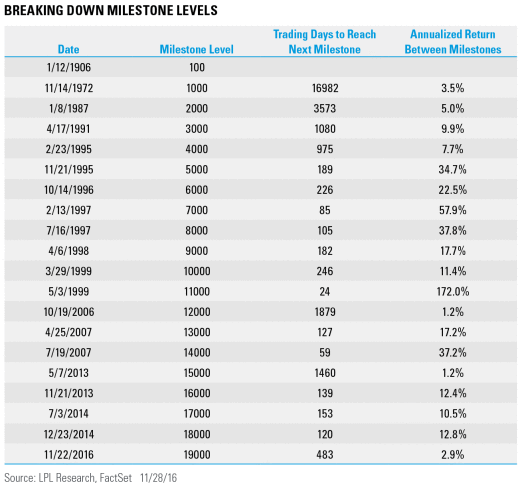 The longest time between milestones was the move from 1,000 to 2,000, which took over 14 years from late 1972 to early 1987. Of course, a move from 1,000 to 2,000 should take longer, as it is a larger percentage move. Regarding the annualized return, the move from 14,000 to 15,000 took nearly six years, and it came out to an annualized return of 1.2%. Let’s take another look at the table above. What also stands out is when there is an annualized return of less than 3% (like we just saw from 18,000 to 19,000), historically, some nice gains happened soon after. Given that the latest milestone took so long to occur, this could potentially indicate that the next few milestones will happen quickly. What has happened after one of the milestone levels is cleared? 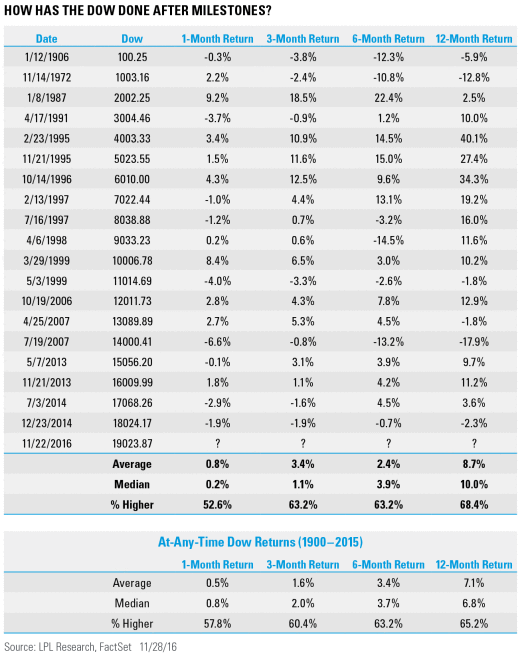 In the near term, there has been underperformance recently, as a month after a milestone has been cleared, the Dow has been lower four of the past five milestones. Looking at all the milestones, the median return a month and three months later is slightly weaker than the at-any-time returns. So some type of weakness isn’t out of the ordinary after these levels are hit, but longer-term they don’t appear to mean much.